If you tried early cordless tool technology and were disappointed, you’re not alone. The batteries did not last very long, they took forever to charge up and the battery-powered tools were not very powerful. Don’t let your past cordless battery experience keep you from checking out today’s new hedge trimmers. Modern electric motors are smaller but more powerful than in the past. This means new hedge trimmers are not as heavy, run quieter and use less energy compared to earlier cordless designs. Advanced Lithium ion (Li-Ion) batteries charge quickly and supply plenty of power to the trimmer and last much longer than traditional rechargeable batteries. Lithium ion batteries are comprised of multiple battery cells. The more cells, the higher the voltage rating on the battery. Amp-hours (Ah) is another measure of battery power. A rating of 2 amp hours means the battery can supply two amperes of electricity for one hour. When it comes to hedge trimmers this theoretical rating gets a little fuzzy. The electrical draw on hedge trimmers rises and falls as branches are cut. Some hedge trimmers provide an estimation of “feet of hedge” cut per charge. Real-life numbers will depend on how thick the branches are on your hedge. It is difficult to accurately calculate exactly how long the battery will last due to the variability in power usage. In general batteries with higher voltage and amp-hour ratings will last longer in-between charges. All of these advancements mean cordless technology has matured enough to make cordless hedge trimmers powerful and effective gardening tools. It’s always good to buy the right tool for the job. With cordless hedge trimmers the main options to look for are the length of the cutting blade and the size of the battery pack. The hedge cutting blade ranges from 6 inches up to 24 inches. The shorter trimming blades are idea for small shrub pruning. It will also be easier to sculpt intricate shapes on the fancy varieties of ornamental evergreens. Also note that smaller cordless hedge trimmers have less-powerful motors and smaller batteries. This is to save weight. Smaller batteries have less capacity and will require more frequent charging. If you only need to trim a few small shrubs, this type of hedge trimmer is ideal. The larger hedge trimmers have blades in the 22 to 24-inch range. The cutting blades will be thicker for cutting through older thicker branches. The motor will be larger in order to move the blades without getting jammed. And of course, the larger hedge trimmers will need a bigger battery to keep things running. If your hedges are older or have thick branches, you’ll want a heavy-duty hedge trimmer. The same applies if there are a lot of hedges to be trimmed. 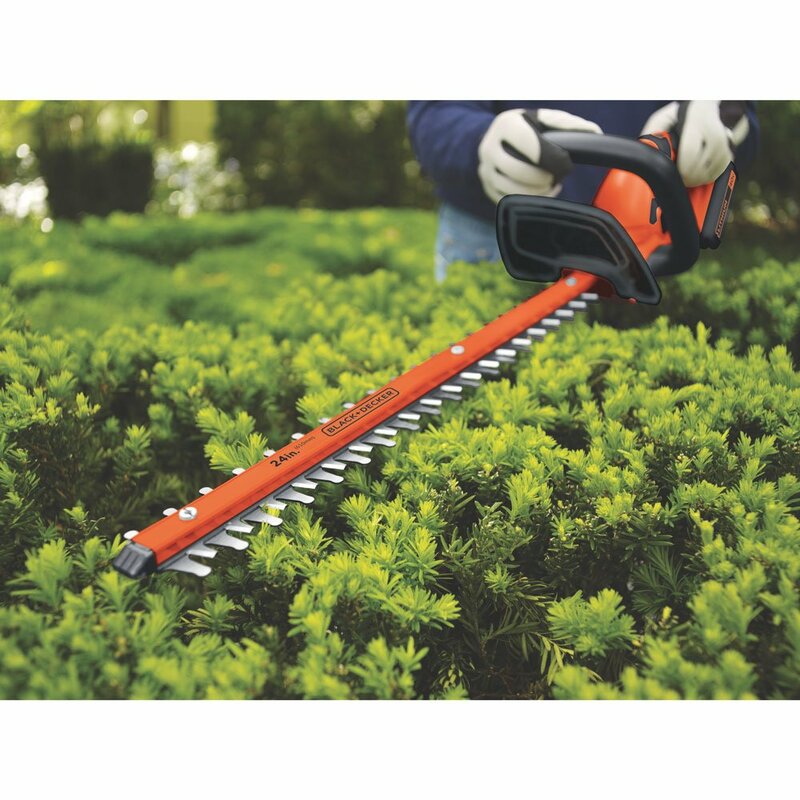 The longer cutting blade makes it easier to trim tall bushes and hedges, without a ladder. Using a light-duty hedge trimmer for larger jobs can over-heat the motor and wear it out prematurely. In the end it will cost more to replace the trimmer than to buy a properly sized hedge trimmer and have it last for years. Black and Decker’s new Powercut hedge trimmer offers plenty of features and the power you need for heavy trimming jobs. 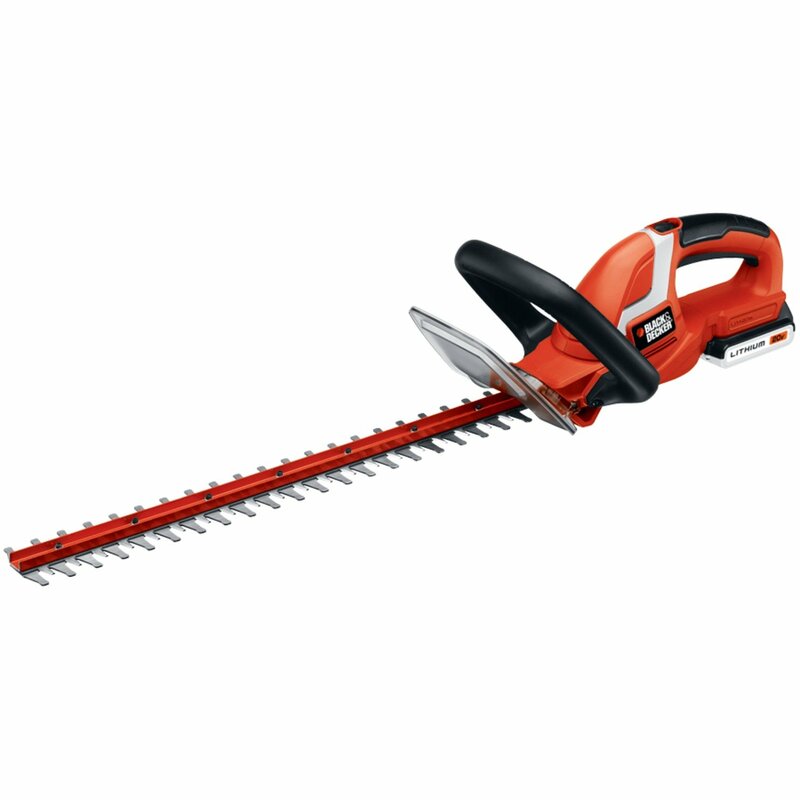 This is the latest, most powerful hedge trimming technology from Black and Decker. If you have a big trimming job, this one is for you! POWERCUT™ allows you to cut through a jam with the push of a button. 24-in. dual-action blade reduces vibration. Quickly cuts branches up to 3/4 in. diameter. Trims up to 6,000 sq. ft. of hedge per charge. Ergonomic handle with premium soft grips improves comfort and control. Maximum initial battery voltage (measured without a workload) is 40 volts. This Black and Decker 22-inch hedge trimmer is an outstanding value and all-around favorite with homeowners. The dual-action cutting blade cuts smoother and has less vibration than other models. It weighs in at only about 6 pounds. Full length trigger with soft grip handle provides added comfort during use. Maximum initial battery voltage (measured without a workload) is 20 volts. The Greenworks G-MAX series offers plenty of trimming power and safety. A hand-guard makes hedge trimming comfortable and safe. The G-MAX lithium-ion battery system works with other GreenWorks tools too. Owners report a high satisfaction level both in trimmer quality and battery life. The WORX WG268 has a molded grip for comfort and laser-cut blades for smooth operation. The light-weight battery fully charges in three hours. The WORX trimmer is rated to trim up to 260 feet per charge. Many gardeners like the balance of the WORKS hedge trimmer. For small hedge-trimming jobs nothing beats the Black and Decker Cordless Shear/Shrub Trimmer. The six-inch shrub trimming blade is ideal for small shrubs and bushes. The lightweight design is easy to handle. The grass shear snaps on so you can trim grass too! Another feature is the LED battery charge indicator. This lightweight trimmer will give you about 20 minutes of trimming per charge. 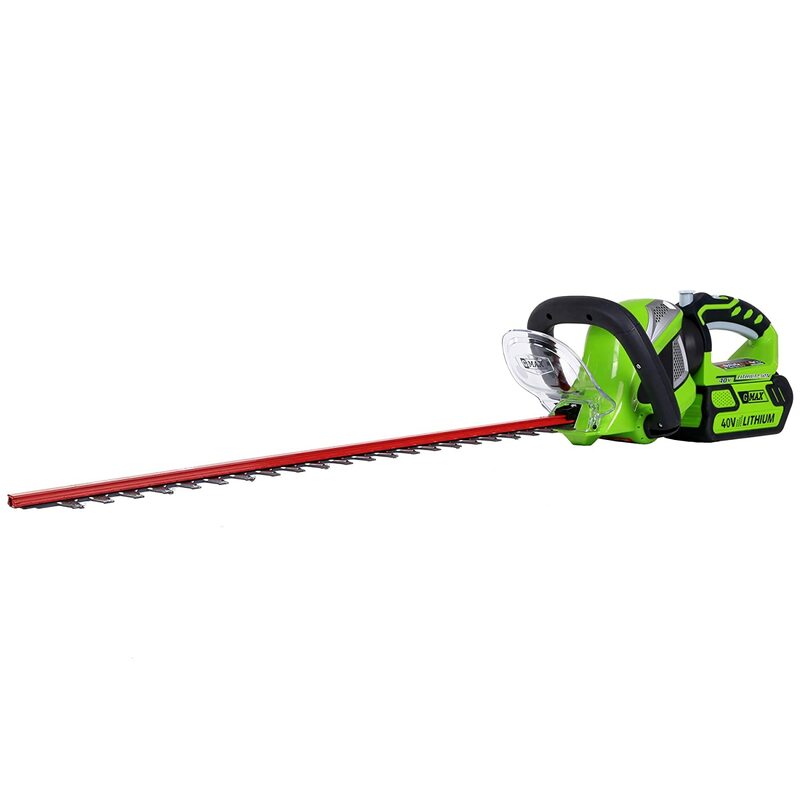 Interchangeable steel blades provide versatility to trim both grass and shrubs. Lithium battery technology for always ready power, greater performance and longer life.